This entry was posted on July 27, 2008 at 11:28 pm and is filed under FILM, literature with tags Capote, Dangerous Liaisons, Doug McGrath, Freddie Jones, In Cold Blood, Infamous, Kevin Costner, Patrick Bergin, Philip Seymour Hoffman, Poltergeist, Richard Brooks, Robin Hood, Robin Hood: Prince, Toby Jones, Truman Capote, Valmont, Zelda Rubinstein. You can follow any responses to this entry through the RSS 2.0 feed. You can leave a response, or trackback from your own site. I didn’t get that sense of compare/contrast in Capote at all. 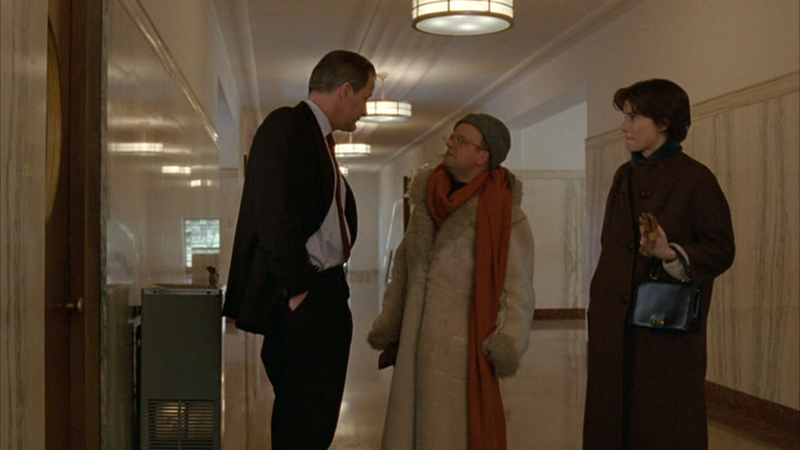 I liked Hoffman in it (despite the size disparity) and the great Catherine Keener. 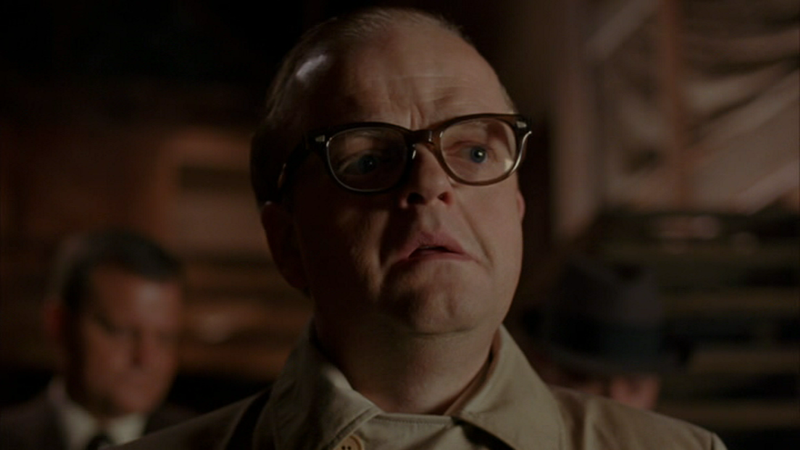 Toby Jones looks and sounds more like the real Capote. But then there’s the real Capote. He was such an annoying puffed-up little poseur that the fact he actually had some degree talent gets tossed to one side. His dialogue for Beat the Devil is marvelous and Jennifer Jones is wonderful playing. . .Truman Capote. She’s by far my favorite movie Capote. His book and lyrics for House of Flowers (music by Harold Arlen) are also marvelous, especially “A Sleepin’ Bee” and “I Never Has Seen Snow.” As for In Cold Blood it’s just a nicely edited True Detective story. At the last he was so controlled-substance-impaired that he could bare write a sentence, despite the best efforts of log-time fan Andy Warhol to help him out. 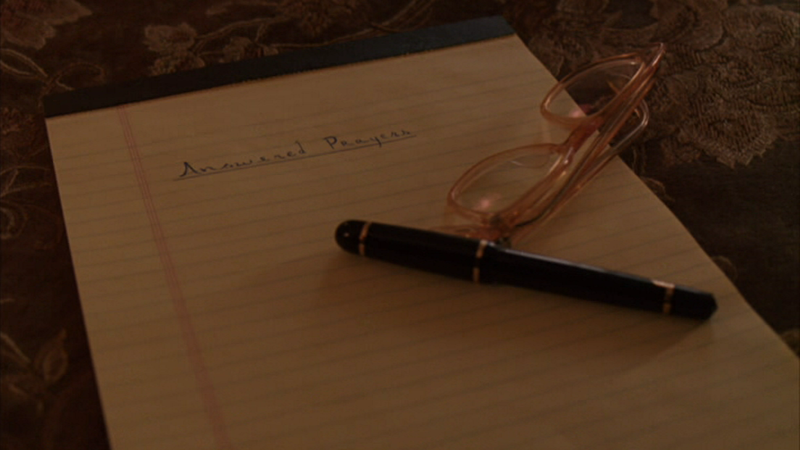 Answered Prayers was just a con, that didn’t pay off. Brooks’ film of In Cold Blood is indeed quite good, especially for Robert Blake’s performance — which may well have proved to be “inspirational” in real life. What’s funniest about Capote is that he has become in the American popular imagination the embodiment of the “Great Writer.” All “Great Writers” in this matrix are “tragic” figures as art (a dangerous toxic substance) drives them to drink (Fitzgerald) or suicide (Hemingway). Capote replaced these macho men with the world’s biggest loudmouth sissy. As always, Gore was absotutely right. Someday someone should make a film of Gore and Truman. It would be a hysterically funny screwball comedy with key scenes set at the Everard Baths (Gore took him there one evening, Truman squealed “I don’t like it!”), Tangier (where they both visited the Bowles’) and sundry courtrooms and law offices. Vidal’s literary adventures, such as the Mailer ruckus, could make a great story. I think Hoffman’s very good too, but he can’t compete with Jones physically, unless they’d shrunk him like a hobbit. I found In Cold Blood, the book, deeply moving, although the “factual novel” thing is baloney, as Infamous makes clear. It’s just hype. I’m sure Robert Blake found all his previous experience useful during his murder trial. I also wonder what Marlon Brando said to him a week before his wife was murdered. Possibly something like “I think you should kill her”? Beat the Devil is great, and Capote did manage to contribute somewhat to the screenplay for The Innocents. So he’s arguably had a more distinguished film career than Vidal (someone should do some research into drafts of Ben-Hur to see if Vidal’s claims can be confirmed). Well I personally wouldn’t claim Ben-Hur myself. It’s a rpofoundly silly story no matter how you slice it. Gore’s career as a screenwriter has never come up to the level of his sophistication as a film enthusiast as Myra Breckinridge (his book, NOT Sarne’s film) and its great sequel Myron, plus his essay-book Screening History make clear. I’ve always had the impression that Gore loves hanging out in Hollywood and knowing everyone and everything that’s going on more than actually “working within the system” — as the saying goes. He’s far too Patrician to put up with that. Well, Vidal was never going to be held responsible for the STORY (I’m sure he’d never have become involved if he thought there was any chance of carrying that can for that). It’s a silly story that sort of works, on its own daft level, and Wyler tries everything he can think of to make it credible. Stephen Boyd, reportedly conspiring with Vidal, gives the film it’s real drama, and has the most gruesome death scene of any film up to that point. True. Then came Suddenly Last Sumeer, where Gore wrote a “surround” to Tennessee William’s great little shocker of a play. But they kept the cannibalism offscreen. Elizabeth Taylor was really teriffic in that one. She really knew that Williams is all about the cadence of the monologue. “Please Don’t Eat the Pansies” was John Gielgud’s proferred alternative title for that. You know, I’ve heard all about it, and I have a copy, and I still haven’t watched it. Terrible of me!